john4jack (Corvallis, Oregon, United States) on 18 November 2011 in Architecture and Portfolio. This was taken under the St. John's Bridge in Portland. The bridge got its name from these cathedral like arches. I took 8 shots focusing on a different arch each time (using Live View), and then combined them in Helicon Focus; it worked like a jewel. beautiful colors, beautiful details and great pov! great image !!! Hell of a result here! Very nice work. Fantastic! 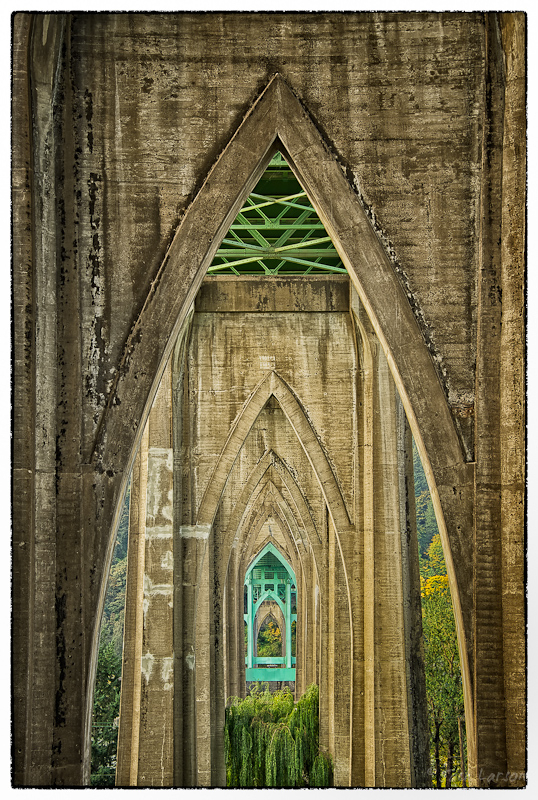 Great processing with the Helicon and interesting look through this amazing bridge. I didn't know Helicon Focus which seems terrific, for some kind of shots. A brilliant shot, Jack...really unusual and special. Magnificent that it DOES look like a cathedral. That's what I thought I was seeing in the thumbnail !! Very good! I like the point of view and the perspective! I love the juxtaposition of nature and structure along with the stunning perspective here! Incredible framing, splendid shot. 5 *. Good day. Awesome framing and composition, great shot. Very nice! Thanks for sharing I mus say your "arching" is successful than the one I also posted today. Thanks for sharing the Helicon Focus tips. I will try it out some day. Do you know if that is what macro photographer also use in order increase the dof? @Albert: Yes; macro photography is my primary usage of Helicon Focus. Yes - a jewel of a shot - brilliant technique! GORGEOUS shot(s) and pp work! Nice HDR work and nice symetrical framing. @Harry: Thanks. It's not HDR. Extraordinary framing with great treatment and colors ! Beautiful result, fantastic and impressive! Just stunning, Jack. Helicon or not. I'm in awe of your mastery. Incredible. Wow that's really beautiful! A cathedral dedicated to nature! Thank you very much for sharing this beautiful photo and the processing of the photo! Outstanding work! My first thought was a church. Then I looked closer, but had to look hard. Your angle of view is perfect. The execution using all those different shots is also perfect. The colors work well--the greenery looks like stained glass windows. Excellent. intéressant ! comme un tableau, presque un parchemin ! Etonnante perspective cathédralesque ! J'apprécie. @elmer: A workshop leader exposed me to this terrific pov.